I love playing with color and texture- and I'm currently on a mission to swatch and document my entire collection, including the 100+ franken polishes I've mixed! I did these for the Dream Nails challenge on Instagram. The polish on my pointer and pinky is a franken polish I made called Party Girl. 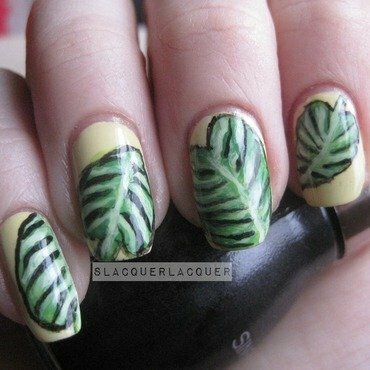 I painted the leaves in acrylic paints on top of Butterhuffer. 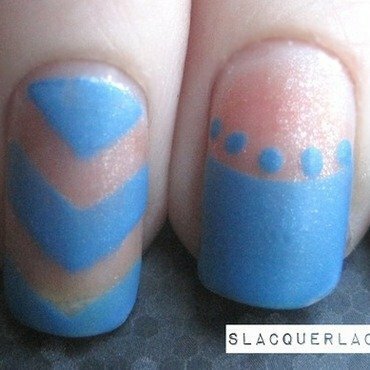 This was for week five (letter E) of the ABC challenge hosted by Nail Polish Society. I chose Elephant Ear leaves. I used a Sally Hansen teal paint pen to scrawl the flowers, and the rest was done with brushes and dotting tools. This was for the letter D for the ABC challenge. 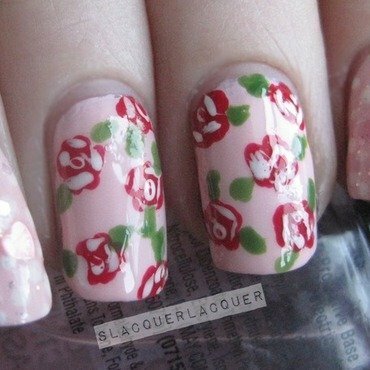 This was for the Dream Nails challenge, and the theme was Girly. 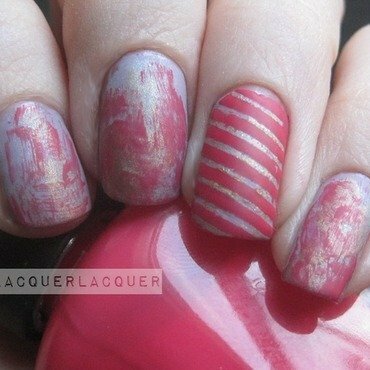 I think this was two coats- with top coat, in daylight. Bright blue shot through with silver shimmer, and the barest hint of a green shimmer in certain lights. 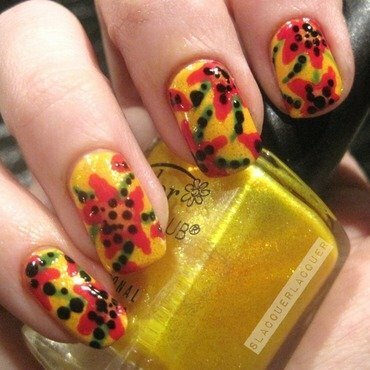 This was for a Mix n Match nail art theme. The blue is a franken polish called Spellbound. 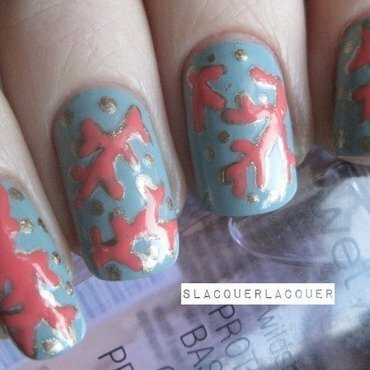 For the letter C of the ABC Nail Art Challenge, I picked Coral. Base was a franken polish called Brain Fog, and the coral is another franken called Flamingo Lips, over L'Oreal Because You're Worth It. All art done with a dotting tool. Done for the Dream Nails challenge. 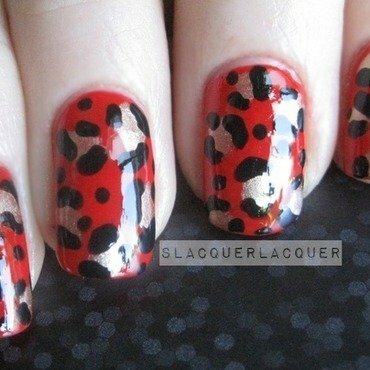 I love leopard print! And these totally remind me of something that Peggy Bundy would wear. Three coats, indirect natural light, no top coat. Three coats, no top coat, shot in daylight. This franken polish, "Dr. Mephesto", is a brownish purple with a green-gold shimmer. 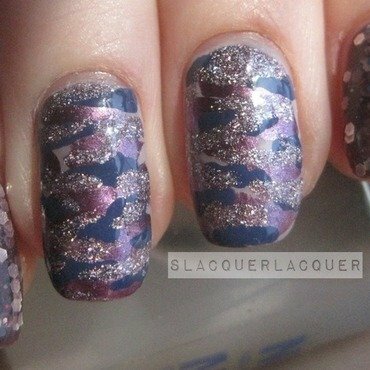 It looks gorgeous matte too- check out my blog for more pictures. Started with one coat of Daisy Does It over three coats of Pull Over, then added flowers, leaves, and dots with dotting tool. 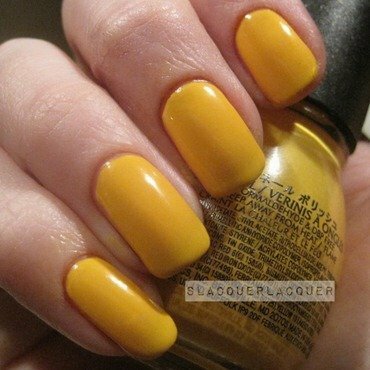 Simpsons yellow creme, three coats + top coat, artificial light. I used the dry brush technique, striping tape, and a matte topcoat. A dusty lavender creme. 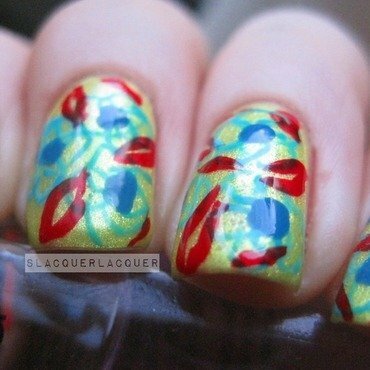 Two coats, no top coat, shot in daylight.